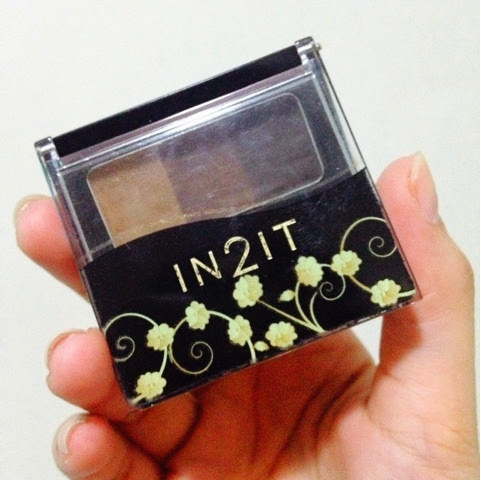 Beauty Budget Series: In2it Waterproof Eyebrow Colour | Vanity and Everything in Between. I'm a bit confused about its shade cos the one I have is #1 but I don't think there is another shade available. This small eyebrow palette comes in 3 shades which is already a good deal because an eyebrow palette that is as small as this usually only has 2 shades - light and dark. No matter what your hair color is, you can achieve the brow color that you want with this product. My hair has always been light ever since I got this that's why the most used colors are the medium and dark shades. The light brow color is barely touched. 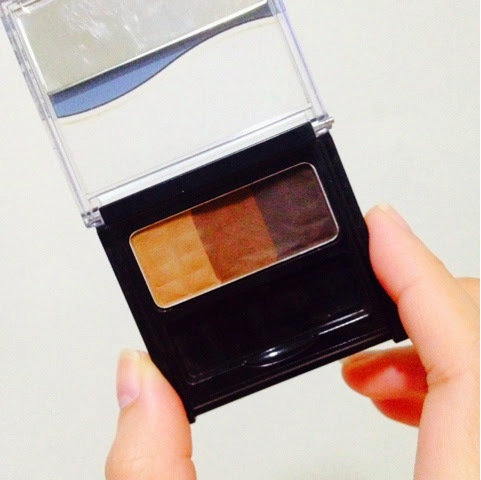 I sometimes use it though to fill the part of my brows closer to the T-zone. Scratches all over this thing. Although I hate it when the case of makeup products get scratches, I also feel a sense of accomplishment because it means that this product is something that I frequently use and abuse. Besides, this stays in my makeup kit and I never take this out in public so I don't mind it being full of scratches. It does come with a tiny mirror inside and eyebrow brush although I prefer to use a bigger mirror and my good ol' Charm eyebrow brush duo. 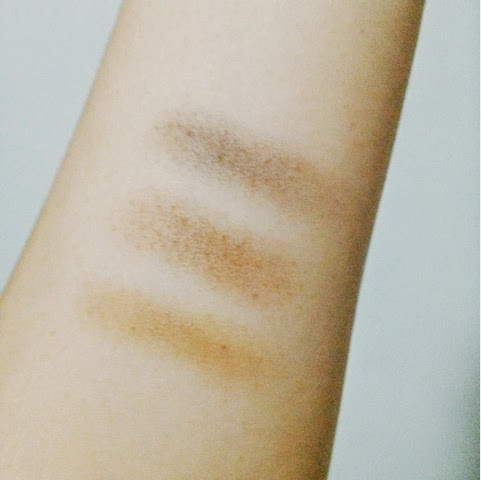 I tried my best to make the true colors of the swatches appear but the camera can't capture it perfectly. That's actually 3 swipes per color. It doesn't show much on the skin but the color shows up and is very pigmented, might I add, on my brows! The photo above shows my fake but perfectly arched brows. I say fake cos my brows are actually thinner without filling. 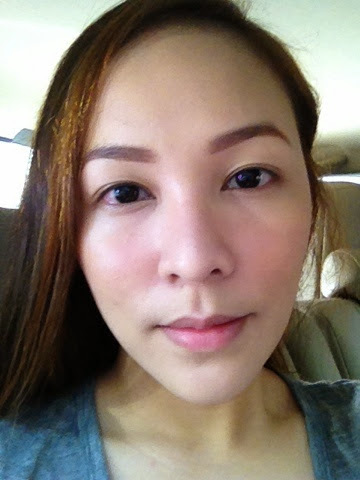 I usually use the dark shade and combine it with the medium shade to fill the rest of the brows. It does stay on the whole day. But there are days when I get home and check my brows to see a little fading, that my brows got lighter making it look more natural. I've also tried this when I went out for a swim and it pretty much stayed put with a little fading, of course. This brow product retails for PhP299 only and I reach for this more than my MAC brow duo powder. I'm not quite sure if it's because of the price tag which also makes me reach for this more often. But considering the price, wouldn't you use this blatantly and carelessly because it is very affordable?! I think I do. Oh yeh, this brow product will take you years to finish. It has an expiration of 5 years but I don't even think I can finish this in 5 years. Caveat, I am light handed. The only reason I am on my second pan is because I lost the first one, haha! 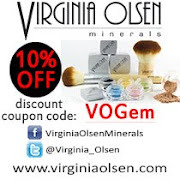 Do let me know if you've tried this and what you think about this product! 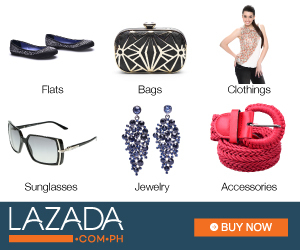 In2it is available at all leading department stores nationwide. It's pretty good. Might not have any use for the lightest shade though...but maybe as a shadow. How many grams is it? Agree! Ok talga to! Kaya lang minsan feeling ko i have this for so long na pero di pa rin ubos haha!